Every now and then it’s necessary to log into a Windows 7 machine with something other than one’s own Lehigh credentials. Windows 7 machines at Lehigh are generally set up to log into ‘AD’ (Active Directory), which houses those credentials in a network server in the computer center, but all machines can _also_ be logged into using _local_ accounts as well. Computing Consultant teams for each college at Lehigh set the password for the local ‘Administrator’ account on the machines they set up, and often create other local user accounts for administration purposes by the users of those computers. So, how do you tell Windows 7 that you mean to use a local account instead of an AD account? Follow step one below. In the login window, simply precede the username with ‘.\’. 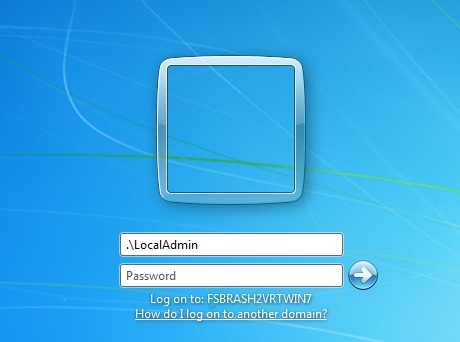 For example, to use an account called ‘LocalAdmin’, you would type ‘.\LocalAdmin’ into the username box. That’s a period, followed by a backslash, which is usually located above the enter key. As soon as you type it, you’ll notice the ‘Log on to . . .” note below the entry box change to reflect the name of the local machine (usually something like ‘FS60ae043212’).